“We opted to rear desi cows Gaulau and Lal Khandhari of Maharashtra as these breeds comfortably adapt to the transitional change in the seasons, survive in odd conditions like less water and food and yields best quality of milk. Although the quantity of milk yield is less but the fat content being high the milk is sold at premium price. On comparing the input and output figures the profits attained are encouraging. However for us more satisfying is that we are providing nutritional and best quality of milk that is largely consumed by children. This fulfillment is invaluable,” highlights Mr. Chetan Arun Raut, founder, Cowism. His farm is located 8 km far from Chandrapur town, Maharashtra. 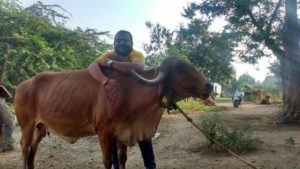 With this venture he is also encouraging farmers in Chandrapur district to rear these desi breeds of cows, provides them guidance on rearing and sells milk jointly. Dairy Co-operatives never segregate milk of desi cows and hybrid cows. They pay flat price for milk irrespective of its source. Therefore Mr. Raut laid the foundation of Cowism. “We procure the milk from the farmers and my farm, pack in half litre pouch and sell the milk to end consumer in Chandrapur town. We sell milk at Rs. 60/litre. This model has been successfully working for past three years with number of farmers and consumers increasing in the network. We work with farmers only on one condition that they must rear only desi cows. 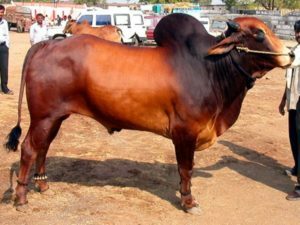 Presently our focus is on Gir, Gaulau and Lal Khandhari breeds,” he asserts. His farm spreads in 14 acre having multiple crop cultivation. 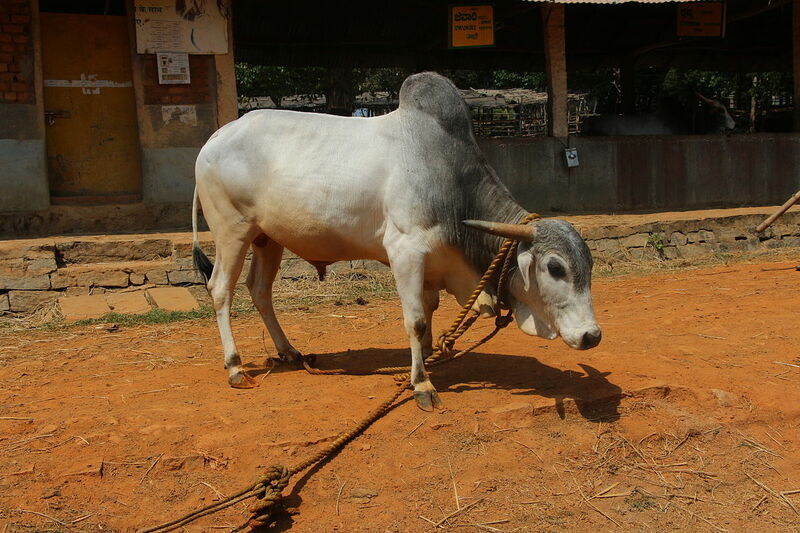 Gaulau is the local dairy breed of Vidarbha region, Maharashtra. It is white in colour with grey shades nears head and dewlap. The hump is moderately developed and dewlap is small. The built is large but is light in weight and medium height. It has short and stumpy horns having blunt points. Its’ head is long and widens near the horns. Flat forehead, small eyes and drooping ears are other characteristics of Gaulau cows. It has loose and thin skin. The tail is long as found in other desi breeds. Limbs are straight and muscular. Lal Khandhari is originally found in Nanded district, Marathawada region, Maharashtra. It is also known as Red Kandhari or Lakhalbunda. As the name specifies it is red in colour. The bulls are darker in shade and has dark brown colour from head till neck. Cows are medium-sized and hearty in appearance. Hump of this breed is medium in size. It has broad forehead, curved horns, small eyes and long ears. Cows and bulls have black colour ring around their hoops. The tail is long. The milk yield of this breed is fairly adequate but the fat content is always more than 4%. Fodder: The fodder is mostly grain dominated so that the milk yield is good. “We source wheat and paddy farm waste to feed our cows as dry fodder. In addition these desi breeds effortlessly feed on farm waste as dry fodder. In green fodder we give sorghum and pearl millet that are grown in our area. We commonly feed our cows with sorghum because it is more nutritious and maize is given alternatively,” states Mr. Raut. The cows are often left for grazing post harvest in fields having cultivation of seasonal vegetables, cotton and grains. These breeds are accustomed to grazing in small herds. Vaccination: Entire herd is vaccinated at the Government run centers and programs. The schedule is followed stringently as prescribed by dairy institutions. “Cows are vaccinated before monsoon. Although theses breeds are sturdy and seldom fall sick yet we vaccinate cows because we leave them for grazing in the open fields,” he insists. Milking: As usual milking is done twice, once in morning and evening. During winters the milk yield increases and in summers it is reasonably fine. “We find milking extremely challenging during monsoon. We follow strict hygiene norms for milking like teats are cleansed before milking. The milking person remains the same because the cows get comfortable and milking is easy. 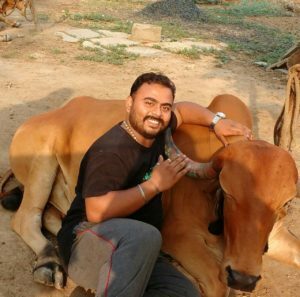 We have a special technique of milking through which the cow feels that its calf is drinking the milk thus is the hassle-free for cows as well as the person engaged in milking,” he shares. Cleanliness: Desi cows are fond of cleanliness. It doesn’t prefer to sit around the dirty area. “We keep the farm area clean so that cows are happy to move around,” states Mr. Raut. Cowism has standardized the model to earn profits from desi cows farming. It will be more fruitful if replicated in other areas, “I am interacting with my friends based at other districts of Maharashtra and other states to carry out similar model in their respective areas. In this way desi cows can be saved and also farmers’ livelihood can be improved. Besides we are in process of learning and producing value added products from cow dung,” he reveals. Cow rearing is more than business for Mr. Raut. “I left the campus placement after completing engineering to put a stop to farmer’s suicide in my Vidharbha region. The only solution to make farming sustainable and profitable is to rear desi local cows. In our region Gaulau and Lal Khandhari are the saviors for farms and farmers. 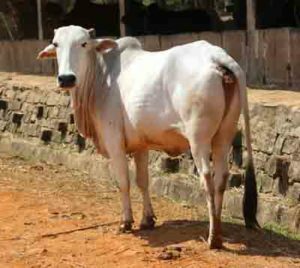 Nature has given one exclusive breed of dairy cattle in every Indian state. It needs to be identified and restored to safeguard the farming zone because only with desi cows and organic farms the future of India will be bright,” he signs off.